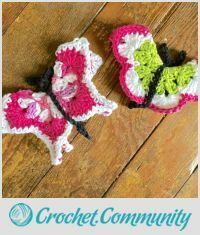 My latest creations are butterflies and when I posted it to the site, meanjaws suggested that we create variations of the pattern. That would be SO much fun! I absolutely love the idea. So here we go! This is where we will begin but butterflies is the topic and any pattern will do. Please find/write/share patterns and pattern links in the comments below. NOTE: if you use someone’s pattern, please give the credit and provide a link to their site. Thank-you. For me, once I tried the pattern, I then created my own variation of it, with different stitches and different colours etc. Be creative and have fun. Oh, and, then, inspire us by sharing your creations in Part 2 of this blog series! Oh the possibilities — what can we use our butterflies for? Hmmm. Please share your ideas and your “butterflies and beyond” creations in Part 3 of this blog series. Have fun everyone and have fun “transforming” your (caterpillar) yarn into a beautiful butterfly. for my first butterflies I used Bernat Handicrafter cotton and the pattern posted above. This sounds like so much fun! Hope I have time to play!